Nacho Mama’s are Chris and Sandra a husband and wife team with a passion for nachos. They are bringing a unique spin to the world of Nachos by infusing a variety of unique flavor combinations that are truly not your Mama’s nachos. Homestyle Lao cuisine featuring a mesmerizing variety of seasonally rotating flavors and textures. Skip the line and arrange a catering request for your group by contacting britneedee@comcast.net at least 2-3 days before your event! Paparepas specialize in the beloved Venezuelan street food favorite: arepas. These circular shaped corn-cakes come stuffed with all manner of different fillings to fit any meal of the day. You can pair any of Paparepas’ arepas with their traditional Venezuelan empanadas. These warm savory treats are so versatile, you’ll be sure to find one to suit your mood any day of the week. Authentic Russian dumplings steaming hot, in three unique sauces with your choice of meat or potato fillings. Skip the line and arrange a catering request for your group by contacting AlaskanDumplings@gmail.com at least 2-3 days before your event! Order any 10 platters of any size, and get 1 extra-large platter for free! Skip the line and arrange a catering request at www.napkinfriends.com or by calling 206-459-4936! Charlie’s is a female owned food truck offering classic American food with an exciting twist. 1/2 lb burgers and yummy cheesesteak sandwiches. Their dishes are created using high-quality local produce, and each item is homemade. To keep things healthy, they use quality organic meat, that is cooked to your preference. They also offer catering for special events! This Seattle-run, family operated hot dog cart is serving up the best street meat in town. The Chavoya brothers may just be the friendliest hot dog vendors you’ll meet. Skip the line and arrange a catering request for your group by contacting ChavoyasHotDogs@gmail.com at least 2-3 days before your event! Come try the only native food truck in Seattle! Juicy burgers and sweet/savory tacos served up on crispy, fluffy fry bread and accompanied by killer healthy or deliciously not-so-healthy sides! Skip the line and arrange a catering request for your group by contacting catering@offthereztruck.com at least 2-3 days before your event! The authentic Italian spirit and flavors of Gabriele's home cuisine from Napoli transition to street food that makes good on its promise to satisfy hunger but blows the mind and palate Bella MBriana brings alive the food you would find walking the streets of Italy: Fried calamari, pesto pasta, chicken parmigana, arancinis, eggplant, cannoli and oh mama mia... Gabriele's homemade meatballs that melt in your mouth. Theo's Gyros is serving up delicious Greek Style gyros with a Seattle twist. Featuring certified Halal beef and lamb, homemade falafel, and heaps of sides, these mythic sandwiches will easily slay your hunger. These days, the Seattle food truck scene is saturated with mix-and-match dishes pulled from every food culture imaginable, from Korean bibimbap tacos to pho sandwiches. With this abundance of dazzling culinary mashups, it can be easy to forget the classics. Carlos Brizzo, of Macho Burgers, however, is out to make sure that doesn’t happen, and to prove that classic recipes still have a place in our growing food scene. And having tasted my own fair share of Carlos’s hefty hamburgers, piled high with both traditional and innovative toppings, I’m inclined to believe him. The care and attention that Carlos puts into the entire process of cooking burgers is what truly sets his apart from your normal, run-of-the-mill burger. 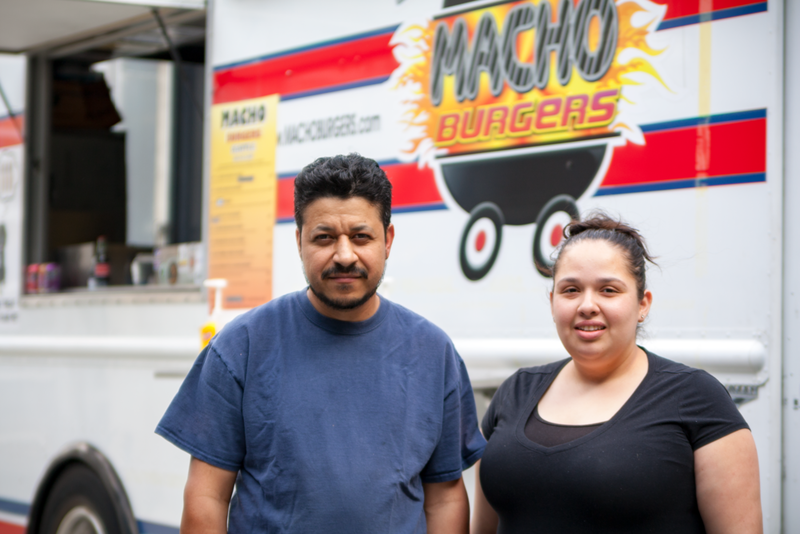 Carlos uses the highest quality, freshest ingredients possible, and prepares every burger to order from the truck he designed himself from the bottom up. A true craftsman, Carlos built the whole interior of the truck to his exact specifications in order to ensure that no movement is wasted and no compromises are made in the pursuit of the perfect patty. The results are some of the tastiest burgers you’ll find in Seattle. Carlos’s veggie burgers have been a particularly popular hit, among both vegetarians and meat-eaters alike, thanks to a perfectly textured veggie patty and topped with a well-balanced assortment of sweet, spicy and savory veggies. Macho Burgers is truly a testament to the idea that simple dishes, prepared fantastically well, can become something truly extraordinary.